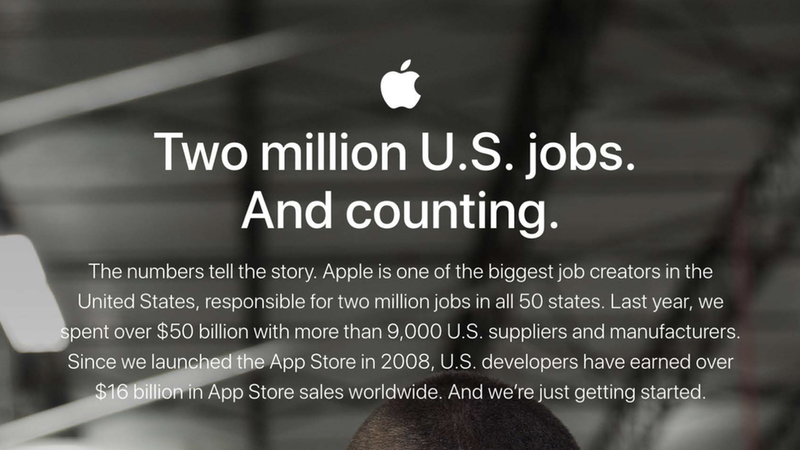 Apple has added a new page on its Web site devoted to all the jobs that the company has created, both the 80,000 in its own company and the two million total jobs it says it has created in the broader economy. The move follows comments Tim Cook made earlier on Wednesday stressing the role that Apple has played. Cook also announced Apple's plans to invest $1 billion in a new fund designed to spur advanced manufacturing in the U.S.
On the new site, Apple offers a state-by-state breakdown of the jobs, which include 450,000 attributable to its U.S. suppliers and 1.5 million in app development. It says 90,000 supplier and manufacturing jobs have been created in just the last year. Why now? Apple is looking to show itself as a major source of U.S. jobs even though final assembly of nearly all its products are done overseas.